One of the ways online casinos market their pokies games towards a larger audience is by integrating the themes of retro films. For example, there are online pokies based on popular films such as Jurassic Park, Top Gun, The Dark Knight, The Avengers and X-Men. Not only do these games integrate the films’ titles into their name, but they also use characters, settings and color schemes from the films to further customize the game. There are a number of different types of retro film pokies games. Online casinos offer five reel, three reel, instant win and progressive pokies to betting enthusiasts. Progressive pokies are attractive for players who wish to try their luck at winning a major jackpot, with progressive jackpots going as high as five or ten million dollars. Here are some nice examples of retro and modern films that lend their name and themes to online pokies, but you can always find out more here. 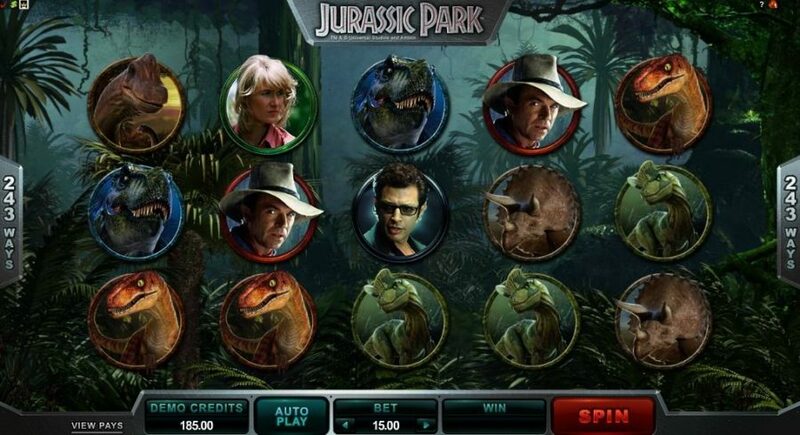 The Jurassic Park game features 243 different ways to win, five types of free spins and 35 wild symbols through a T-Rex Alert. Players who get at least three scattered Amber Fossil symbols receive 12 free games and other special bonuses. The free games are either Brachiosaurus, Dilophosaurus, Triceratops, T-Rex or Velociraptor. All the games feature free spins, while they alternate between mystery multipliers, winning wilds, running wilds, wild reels and split wilds. The Dark Knight five-reel progressive pokies slot game also features 243 ways to win. The wild symbol is replaced by a Dark Knight logo, while a combination of the Batman and Joker’s faces serve as the scatter symbol. The wild acts as a replacement for any symbol while making a combination, except for the scatter symbol. When players get a scatter symbol, they get a two symbol double stack win. Three or more scatter symbols anywhere in the reel unlocks free spins. There are four progressive jackpots in the Dark Knight game: mini, minor, major and mega progressive. The game chooses jackpot winners at random, while the Bonus Wheel featuring the Batman and Joker shows which of the four jackpots was hit. Marvel has a number of pokies games, with The Avengers progressive jackpot game being one of the most popular. The game features 20 pay lines, free spins, the Nick Fury S.H.IE.L.D. Logo as a wild symbol and the Avengers logo as a scatter symbol. All the major characters from The Avengers film universe are visible, and the game’s graphics and sound effects make for an absorbing experience for online gamblers. The lower value symbols in The Avengers are Q, A and K, while symbols such as Nick Fury, Thor, Black Widow, Captain America and Iron Man have greater value. Two wild symbols on an activated pay line triggers separate winnings, while three scatter symbols anywhere in the reel is a winning combination. Based on the highly successful 1986 movie starring Tom Cruise, the Top Gun pokies game consists of five reels, 20 pay lines and 20 max coins. There are bonus games and free spins, along with wilds and scatter symbols. The F-14 serves as the scatter symbol, with three scatters resulting in a bonus game. The Top Gun logo is a wild symbol. Players can win up to 10,000 coins in this game, with the maximum money jackpot coming in at $50,000. Gamblers who only place one cent bets are eligible for a max win of $100. The bonus game triggered by three scatters features a mini game where the player must shoot down an enemy Mig. More shot down planes result in higher winnings. The likes of Magneto, Professor X, Mystique, Storm, Sabretooth and Storm feature in the X-Men pokies game. This game contains five reels and 25 pay lines, along with a special X feature and a bonus game of heroes vs. villains. The progressive jackpot in this game triggers randomly. Players who get three X-Men logo scatter symbols in one spin automatically go into the heroes vs. villains free spin bonus game. Players start off as a hero, with continuous free spins until a Magneto logo appears on the screen. The Magneto symbol transfers the player to villain mode, where an additional eight free spins are available. If the Xavier logo appears in villain mode, the player goes back to hero mode and restarts the free spin cycle.